The Samsung CLT-Y406S Yellow Toner allows users to take full advantage of the advanced, easy-to-use features and benefits built into every Samsung printer. CLT-Y406S The Samsung CLT-Y406S Yellow Toner allows users to take full advantage of the advanced, easy-to-use features and benefits built into every Samsung printer. 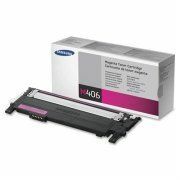 CLT-Y406S toner cartridges are a cost effective alternative to buying brand new name brand Samsung toner cartridges. Our compatible toner cartridges are guaranteed to contain as much toner as original toner cartridges. In some cases we actually add more toner for increased lifespan! CLT-Y406S toner cartridges are manufactured under strict ISO-9001 standards using only the highest quality inputs in order to achieve the highest quality remanufactured toner cartridge. Our CLT-Y406S and other ink cartridges & toner cartridges include free shipping on orders over $49 and are covered by our standard 1 year defective product warranty. To Recieve updates and possible rewards for Samsung CLT-Y406S Yellow Toner please sign in. To Recieve updates and possible rewards for Printer Cartridge, Ink & Toner please sign in.